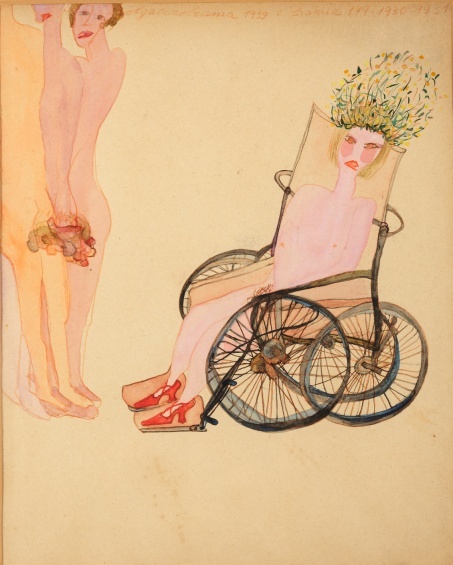 Join us for a New Perspectives tour where we consider how the concept of desire operates in the work of Carol Rama and Kaari Upson. Despite their different generations, upbringings, environments, and practices, both artists seek, or sought, to understand the mechanisms of desire in everyday life: how it manifests in the body or in our behaviors, how it is expressed or repressed. In “Carol Rama: Antibodies,” we will examine how Rama’s work often explores the intersection of desire and anger, analyzing the ways in which literal and figurative bodies express these complex states of being in her work. In “Kaari Upson: Good thing you are not alone,” we will identify sites of desire within the so-called American dream—consumption, branding, and the housing market—and work together to understand these in relation to Upson’s investigations of psychology, familial relationships, and the anxiety of failure. This program is made possible, in part, by the New York City Department of Cultural Affairs in partnership with the City Council, and the New York State Council on the Arts with the support of Governor Andrew M. Cuomo and the New York State Legislature.